Finding Wonderland: The WritingYA Weblog (archive): Toon Thursday: Grand Prize Winner!! The grand prize winner of the inaugural Toon Thursday Contest, with the funniest answer to the question "so where do you get your ideas? ", is the hilarious Minh Le of Bottom Shelf Books. As always, click the cartoon to view it larger. 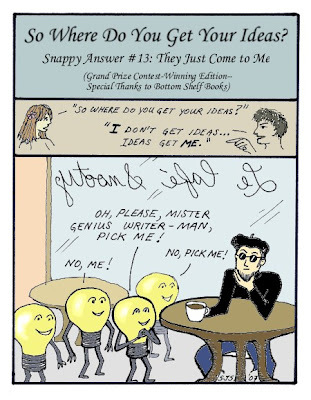 Minh will be receiving a fabulous prize courtesy of Finding Wonderland, and his winning idea has now been immortalized in the above cartoon. Congratulations to Minh! The other three winning entrants are Sara Lewis Holmes, liquidambar (aka writerjenn), and Little Willow...and we couldn't resist giving an honorable mention to Alkelda the Gleeful, so for the next four weeks you'll be seeing the rest of those snappy answers cartoon-ified. Congrats to all the winners, and thank you to all the entrants--and not just because I now have ready-made ideas for the next four Toon Thursdays! This was a lot of fun--hope you enjoy the results. Also, a special thank-you goes to my husband, mr. fortis (not his real name), for his assistance in judging the contest entries. I can guarantee you that he was an impartial judge. In fact, when I asked him to help me judge the contest, he claimed I hadn't even mentioned the contest in the first place...which, sadly, is entirely possible. One last note--don't forget to visit today's wonderful Robert's Snow posts featuring illustrators with much more skill than I possess--a link to today's schedule is in the post below. Congrats Minh Le! Great cartoon. And yay to Sara, LW, Alkelda, and writerjenn! Can't wait to see their toons. Congratulations to Minh and the other winners. I am thrilled to be among them. And you will probably not believe this, but today someone who'd just found out that I write asked, "Where do you get your ideas?" Sweet! The cartoon looks great, I can't wait to see the others! Yeah! I am Queen of the Honorable Mentions! :) Seriously. I'm looking forward to seeing all of the cartoons. Please, just draw, draw, draw.